When the Pretenders regrouped, for want of a better word, at AIR Studios in central London on July 20, 1982, it was amid traumatic circumstances. Only singer/songwriter Chrissie Hynde and drummer Martin Chambers remained from the depleted band. The previous month, on June 14, bass player Pete Farndon had been kicked out due to his chronic drug habit, and two days later fate had then dealt the ultimate ironic blow to one of those who'd been party to Farndon's sacking: lead guitarist James Honeyman-Scott, whose musical versatility had played a large part in the band's success, was found dead from an overdose of heroin and cocaine. Farndon would succumb in similar fashion the following year, yet in the meantime Hynde, pregnant with the child of Kinks frontman Ray Davies, penned a moving tribute to Honeyman-Scott entitled 'Back On The Chain Gang'. She and Chambers recruited some replacements at very short notice in order to record the song: former Manfred Mann's Earth Band guitarist Robbie McIntosh, whom Honeyman-Scott had already enlisted to play alongside him in the Pretenders, plus Rockpile guitarist Billy Bremner and Big Country bassist Tony Butler. As on the band's first two albums, Pretenders and Pretenders II, Chris Thomas was in the producer's chair, yet this time around the engineering would be taken care of by Steve Churchyard instead of Bill Price. 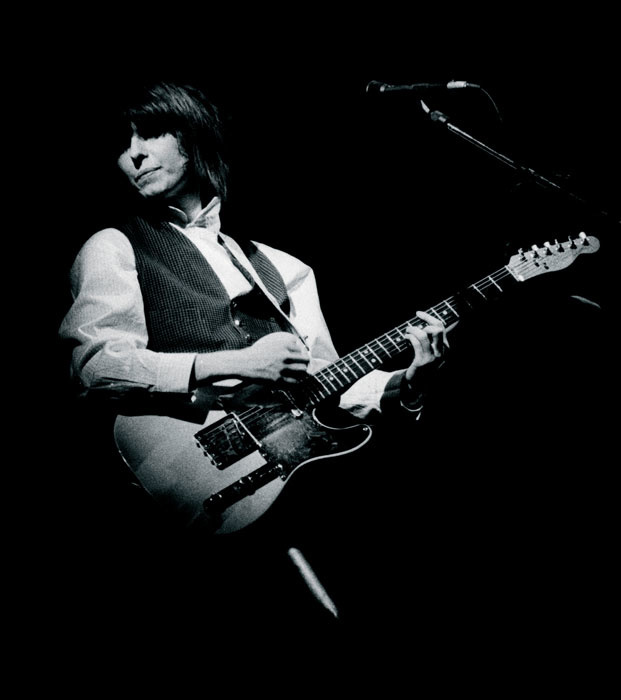 After Nick Lowe had produced the band's first single, a cover of Ray Davies' 'Stop Your Sobbing' which made the UK top 40 in early 1979, the Pretenders had enjoyed chart success on both sides of the Atlantic with the aforementioned albums, as well as the singles 'Kid', 'Brass In Pocket' and 'Talk Of The Town'. And according to Churchyard it was the "creative genius" of Chris Thomas that accounted in large part for the group's distinctive sound, as well as their ability to bridge the gap between punk, new wave and melodic pop. "Without a doubt, if George Martin was the fifth Beatle, then Chris Thomas was the fifth Pretender," Churchyard says. "He was hands-on in all aspects of the recording, whereas a lot of producers produce from their phone in the car. He was there for every moment of whatever was going on, directing either me or the musicians, and in many respects he was my mentor. I probably learned more from him than anybody else." The producer and/or engineer for an incredible array of artists, including the Stranglers, Rod Stewart, INXS, Madness, Paul McCartney, Big Country, Joni Mitchell, Counting Crows, Cliff Richard, Ricky Martin, Celine Dion, Sinéad O'Connor, Tim McGraw, LeAnn Rimes and, most recently, the Eagles, Herbie Hancock, Dishwalla, Beck, Ben Folds and Sheryl Crow, Steve Churchyard grew up in Surbiton, Surrey, and entered the business in 1974 as an assistant at the tiny Orange Music 16-track studio in London's Soho. This was located in the basement of a guitar shop on New Compton Street, where it wasn't unusual to see the likes of Jimmy Page or Paul Kossoff trying out new instruments, and Churchyard remained there three years before continuing his engineering career at AIR. "That's where I'd always wanted to work," he says. "I'd initially failed to get an interview there and went to Orange instead, but after three years I called AIR's manager Dave Harries and he offered me a job as an assistant. This was kind of a step back, because I'd gone from a tape-op at Orange to being an engineer, chief tech and studio manager — it was like a one-man operation. However, I jumped at the chance. A lot of the records that I listened to back then were made at AIR, as well as at Olympic and Morgan — Rod Stewart and the Stones and Zeppelin — so I really wanted to work at AIR, and my first job there was assisting Geoff Emerick on Wings' London Town album, at which point I realised I really knew nothing at all about recording. "At Orange I'd been working with a home-made, two-inch tape recorder, built by one of the guys who worked there, and it sort of worked here and there. There was no remote control for it — I was the remote control — whereas AIR was a 24-track facility with four studios, about eight technical engineers and probably eight full-time sound engineers, including Pete Henderson, Steve Nye, Jon Kelly, Colin Fairley and, of course, Geoff, who was chief engineer. Not only did I get to assist the greatest, but George Martin was my boss and I just made myself available for whatever was going on, so I got to work with George on a lot of different things, including a number of Paul McCartney sessions." 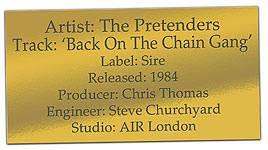 "Since they had previously recorded at AIR and Wessex, I'd already met the Pretenders," Churchyard remarks. "I'd be down the pub chatting to them, so I knew them all socially before I ever worked with them. Now Jimmy [Honeyman-Scott] and Pete were gone, and it was a really difficult time for Chrissie and Martin. They were still in shock, basically, and the rest of us were all very sympathetic to what was going on. I don't think anybody really knew what state the Pretenders were in at that point. Chris got hold of a number of different people and the session was just kind of pasted together." While Tony Butler played bass on 'Chain Gang', with Robbie McIntosh playing rhythm guitar and Billy Bremner playing the memorable lead part, McIntosh would take over on lead for the subsequent, appropriately titled Learning To Crawl album, which would mostly feature Malcolm Foster on bass. All of the recordings took place in AIR's Studio One, which housed a 56-input, 24-track Neve 8078, one of three built for AIR, designed in conjunction with George Martin, and now considered vintage although it was then state-of-the-art, boasting a frequency response from 40Hz to 100kHz, ±1dB. 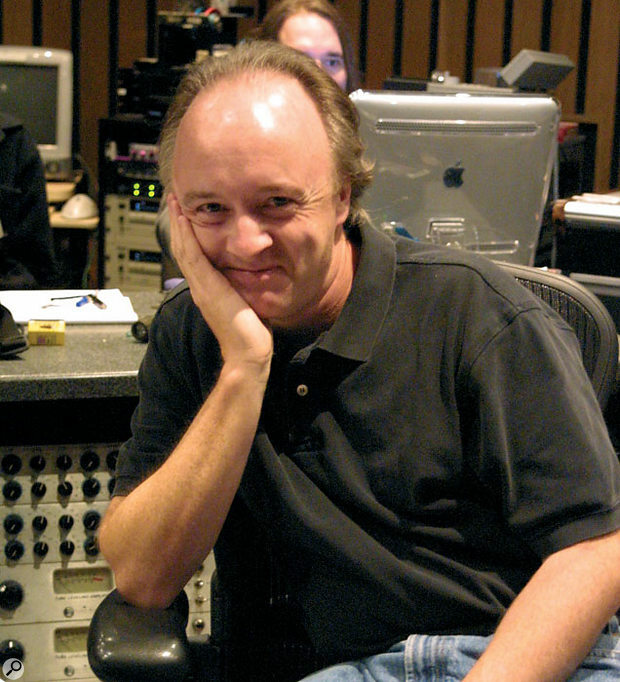 "Its EQ was designed by Geoff Emerick and it had 34427 remote mic pres that are on the new Neve 88R," Churchyard states. "That console, which had no automation, is now at AIR Lyndhurst and has got GML. Everything we did was manual mixing." A Studer A800 Mk III tape machine and JBL 4350 monitors were housed inside AIR's spaceous fourth-floor Studio One control room, where windows afforded real daylight from London's Oxford Circus, and the adjacent live room was large enough to accomodate a 60-piece orchestra. "That fourth-floor space was originally a banqueting hall," says Churchyard. "The main room was pretty live, with very high ceilings and linoleum on the floor, and there were also three isolation rooms; one on the left as you looked through the control-room glass, one to the right, and one at the back that was always full of gear." According to the engineer's recollection, he never heard a demo of 'Back On The Chain Gang'. Instead, he assumes it was rehearsed before the band entered the studio. "The 'B' side of that single was 'My City Was Gone', and the bass riff was something that Tony Butler used to play just as a warm-up," Churchyard recalls. "He was playing it in rehearsals and the song grew out of that. I wasn't at the rehearsals, but I do remember the tracking session, and because it was the 'B' side, we knocked it out real quick." "The structure for 'Chain Gang' had already been figured out when they came into the studio. I mean, Chris [Thomas] was always well into the song and the arrangement, even though some stuff was invariably changed on the fly. We would do a number of takes, and because everything was 24-track analogue we'd do takes and then we'd do edits. Chris would say 'OK, take three,' and we'd take a chunk out of that and splice it together with various other takes before getting ready to do overdubs. 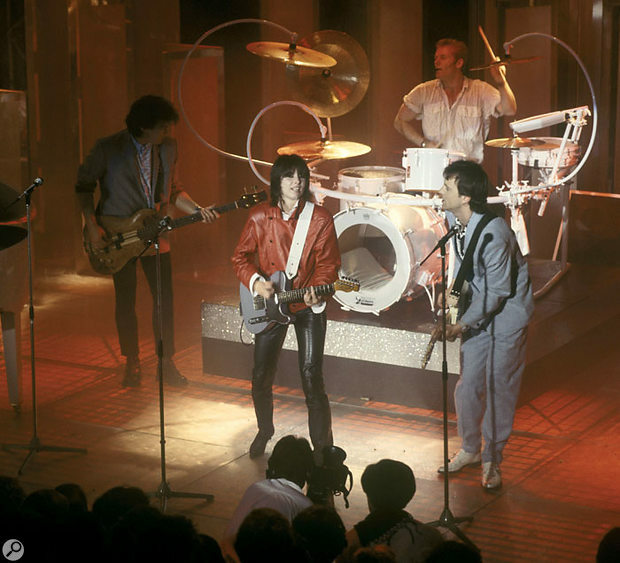 "The Pretenders were set up as if they were going to play live — for 'Chain Gang' we had Martin's kit on a foot-high riser in the centre of the room. I'm not sure what the riser did for the sound, but it looked great. We used a PA behind him — some small Yamaha self-powered speakers — and once we got the drum sound we'd send stuff back from the control room out through that PA just to pump up the sound in the room. It would either be snare drum or toms, and if he was playing along to a Linn 2 drum machine, which we used a lot as a click, that might also go back out through the PA and become part of the drum sound. The delays that you can hear on the drum sound of 'My City Was Gone' were AMS delays sent through the console and back through the PA, giving a kind of tinny quality — tinny in a good way. "As a drummer, Martin was great. Invariably, we'd go for performance over any timing factor, and we'd cut it together old-school style. The Linn 2 sat beside his drum kit, we'd figure out the tempo for the song, and he'd either play to a click track or some kind of loop that he would make. Then, depending on the loop, with some songs we would actually feed that back through the PA. There's Linn drum running throughout the song 'I Hurt You' — it was going out through the PA, into the room, and Martin was playing along to it, so it became part of the song. "This whole PA thing was kind of new to me. Chris Thomas and Bill Price had designed it to fill the room with more sound, and Martin also liked it because it was like being on stage, hearing everything through his monitors. He'd feel the kick drum coming back at him, and it was just more live than the usual studio dryness. His kit was miked with [an AKG] D12 on the kick, Sennheiser 421s on the toms, a [Shure] SM57 on top of the snare, a [Neumann] KM84 on the bottom of the snare and a KM84 on the hi-hat. This was kind of a standard setup. The overheads were AKG 451s, although to this day I normally use Coles 4038s. "Aside from Martin's playing, it was also thanks to Chris Thomas that the drums sounded so great. The live tracking, playing with the Linn drum, putting it out through the PA — Chris ensured that it sounded very organic while at the same time employing some trickery that the listener wouldn't really be aware of in order to make it sound exciting. You know, we might just set up a mic in the middle that would have some kind of ridiculous compression on it, or something like that, and mix that back in there. This was the result of Chris having been George Martin's assistant on the Beatles' White Album, through the Badfinger days and working with Roxy Music and Brian Eno. He's been around a lot of creative people." "When it came to her vocals, Chrissie was great so long as nobody else was in the room," Churchyard says. "The band, everybody was kicked out. They all went upstairs and played pool, and nobody was allowed to come back down until we'd got them. Only Chris Thomas and myself were in the control room while Chrissie sang, and he'd have to coax a performance out of her. Chris was all about that. On a vocal day we might sit around for hours and drink tea and have lunch and chat about everything other than what we were about to do, and then at a certain point — which was part of Chris's gift as a producer — he would say 'OK, how about now?' Sometimes he'd also wait for her to decide when to sing it. "The 'Chain Gang' vocal was comped from three or four takes, and then Chris sang her own harmonies before Martin and Tony did the backgrounds. That lead vocal was all Chrissie. I put a [Neumann] FET 47 in front of her and had [a Urei] 1176 compressing her through the custom Neve board, and that was basically it. Still, having just listened to the song again to remind myself what it sounds like, I've noticed a giant pop on the first line — 'I found a picture of you...' Hearing it 20-odd years later I'm thinking 'Oh, I wish I fixed that.' That's what happens when you don't use a pop shield. "On the surface, Chris [Hynde] was all business when it came to this song — let's get this done, and don't let anybody in the control room or else you'll suffer the wrath of Chrissie. If she was at all acerbic, then rightly so. The studio is never a very natural environment in which to sing, and so we'd do anything we could to make her comfortable. If you catch her on the wrong day, things can be heavy, but she can also be very funny, and she was very easy to work with when we did 'Chain Gang'. Only later did I realise how emotional it must have been for her." While bass player Tony Butler, standing to Martin Chambers' left, was DI'd, Robbie McIntosh played his Strats on the other side of the kit, his amp in one of the isolation booths, miked with a combination of Shure SM57 and Neumann U87. "A lot of the time the guitar sounds were so layered with multiple guitars, it's hard to now figure out where one starts and another ends," says Churchyard. "We'd use Rickenbacker six-strings and 12-strings, Strats, Les Pauls, everything." Billy Bremner, standing next to the bassist, played a Telecaster, as did Chrissie Hynde, standing in front of Martin Chambers. Both guitars were miked with the same SM57/U87 combination employed for Robbie McIntosh, while Hynde's scratch vocals were recorded with a Shure SM58. "The band members could almost touch each other," Churchyard says, and given the circumstances surrounding the sessions, the mood was not as bleak as you might imagine. "As I've said, there was a slightly strange atmosphere, with no one really sure if the Pretenders would continue as a band, but we also had some fun. For instance, that hammer sound in the choruses involved us all going around banging stuff together to try to get the right effect. In the end, the best sound came from these 25-pound weights that were normally used to hold the orchestral boom mics in place and stop them falling over. My assistant, Jeremy Allom, was therefore commissioned to bang them together — if you meet him today, his arms are probably a little bit longer than they should be. It took more than one take. I mean, you can imagine trying to smash two weights together in time. In those days there was no digital technology to sample a take and paste it in. It all had to be played. Mid-'80s brochure from AIR Studios on Oxford Street shows the Studio One and Two control rooms, both of which were used during the recording of the Learning To Crawl album. AIR Studios moved to Lyndhurst Hall in Hampstead in the early '90s.A mid-'80s brochure from AIR Studios on Oxford Street shows the Studio One and Two control rooms, both of which were used during the recording of the Learning To Crawl album. AIR Studios moved to Lyndhurst Hall in Hampstead in the early '90s. "Then there were the background vocals, the 'oohs' and 'aahs'. Martin Chambers and Tony Butler did these, but at first Chrissie didn't think their efforts were good enough, so she bent over in front of them and wiggled her bum while they were singing. We all fell about laughing, but I have to say it achieved the right results." No such encouragement was required for Billy Bremner's ringing, countrified solo which, along with Hynde's vocal, served as the backbone and focal point of the song. "That was probably done in one take," Churchyard surmises. "I think he just played it. I don't remember any struggle. It was one of those inspired things. Everyone flipped at how he played it and then we all went down the pub." Effects were sparse. "They were pretty much spurned," says Churchyard. "And besides, we didn't have many. There was an EMT 140 echo with tape delay, maybe an MXR flanger here and there on the drums, some compression on bass and overall compression in the mix, but back in 1982 things were still pretty basic." 'Chain Gang' was tracked and cut together in a day, and then a couple of days were spent on the overdubs: lead vocal, backgrounds and some additional guitar parts, as well as Jeremy Allom's bashing together of the 25lb weights. The remainder of the Learning To Crawl album was recorded and mixed through the end of 1983, with plenty of breaks interspersing the sessions while Hynde came up with new material, the last of which was that ethereally beautiful Christmas number '2000 Miles'. "For the intro guitars on '2000 Miles' we used an Eventide 949 Harmonizer, with the guitars pitched up two octaves and some feedback," Churchyard recalls. "If you check the song out, there's this really high guitar part that runs throughout, played by Robbie McIntosh. By that point he was playing all the lead guitar. He was a great guitarist and a lot of his solos were done in just one take. 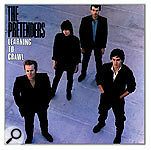 In 1983, the Pretenders went out on the road a little and got to know each other and learned to be a band again. "One of the most challenging songs on the album for me was one that sounded kind of simple but had layer upon layer of guitars — 'Middle Of The Road'. It sounds like one guitar playing the riff, but there were at least six guitars. The riff itself was chopped up into pieces — there were the high and the low parts, both doubled, and each part was played individually and left to ring, sustained through the next part. It was Chris Thomas's idea to do it that way, and although it took a long time and was quite a laborious process, the end result was fantastic. "Invariably, when we'd get to guitars everything would be layered. That's the classic Pretenders sound. It's a sound that Jimmy [Honeyman-Scott] had created, along with the great live feel of Martin's drums and having Chrissie's vocal really loud in the mix, leaving no doubt that she's in control of the song. Over the years people have asked me 'How did you get that sound on her vocals?' Well, I put a 47 in front of her, she sang it and we made sure you could hear it. It was all Chrissie Hynde. And it was very much in the tradition of all that early British pop where the vocals were so far out front. That would never fly today. "Unlike some vocalists, Chrissie wasn't all that shy about people hearing her, and she also didn't hold back when it came to her opinion on a song. Chris Thomas once told me that Chrissie had said '"Brass In Pocket" goes out as a single over my dead body.' Of course, it did, and it did OK. She was quite happy, meanwhile, to track her guitar parts and have all the other guitars layered on top. We were very conscious about retaining that Pretenders sound, and if anything got too challenging we just went down the pub. I don't remember any violent mood swings. Everybody was very mellow." The mix, which took place in the same studio, on the same console, in August 1983, basically amounted to balancing the tracks and trying to present them in their best light. As Steve Churchyard remarks, "there were no real surprises. I'd generally spend a few hours setting things up, and then once I'd got the track in what I considered to be a reasonable shape, Chris [Thomas] would come in and we'd work on the mix together. We'd just put it down on half-inch analogue at 30ips, and, because there was no automation, if we had to punch in we'd just stop the tape, wind it back a little bit and make an edit. "The only song that wasn't mixed in Studio One was 'My City Was Gone', which was mixed in Studio Two. I remember saying to Chris 'Why don't we try mixing this at 15ips on half-inch? That might be cool.' And that was an interesting moment, because we had the mix and then it was 10 o'clock and time to go down the pub before it closed. When we came back to check the mix, Chris said 'Yeah, it sounds good, but I've got an idea for an edit.' I said 'Chris, I'm a bit drunk right now. This is not the time for razor blades.' He said 'No, no, don't worry about it. I'll tell you where to cut.' The job's difficult enough when you're sober, so that wasn't a great moment... I got through it, but I don't recommend it." After recording a couple of the Pretenders' 1984 Stateside concerts for MTV broadcast, Churchyard didn't work with the band again. That same year he departed AIR to go independent, and following numerous US assignments he relocated there in the early '90s, where he now resides in San Diego while doing much of his work in LA. Among his most recent engineering projects was the mix of an album by Juliette & The Licks, the outfit of actress Juliette Lewis. "She tracked me down because of my work with the Pretenders," says Churchyard. "The Learning To Crawl album has generated a lot of work for me, and while that's great, it's sometimes difficult when people want me to reproduce that Pretenders guitar sound. 'OK, well, can you play like Robbie McIntosh?' Still, I'm flattered by how I'm associated with that album, I think it's awesome. Unlike a lot of '80s recordings, especially the synth-based stuff, the Pretenders' material hasn't dated, and the reason for that is it's a rock band. "When we finished 'Chain Gang', it was the first song by the new Pretenders, and I've always thought it sounded a bit thin, lacking in bottom end. That's my own personal issue with it, whereas I think the subsequent tracks were tonally better. However, it never seemed to bother anybody else, and if it was a bit thin then it actually might have helped the sound on the radio. Now, listening to it for this interview, it sounded pretty good. "I mean, everything was analogue — it was tracked on analogue, cut together, and then everything was comped and worked within that medium. It was also mixed to analogue, and then once we did all the mixes we'd do what Chris [Thomas] would call a production master, where, rather than let the mastering engineer EQ it, we would do our own EQ, balance it all out, level from track to track, cut and sequence it, and comp it to another two-track. So, I don't know how many analogue generations that is, but in this day and age it's pretty astounding that there's anything left of it."